Rolls-Royce has announced a new deal with Intel as part of the engineering firm’s mission to build fully autonomous ships. The company (which separated from car brands of the same name) has been working on autonomous shipping technology since the early 2010s, and it said last year that it wants to launch its first uncrewed ocean-going vessels by 2025. As a first step toward that, it launched its Intelligent Awareness system for crewed vessels earlier this year. The system is comprised of a network of cameras, LIDAR, and radar, which is all overseen by a central program. Using machine vision algorithms, this program looks for obstacles like other ships and sends automated alerts to the crew. As part of its new deal with Intel, Rolls-Royce will use the company’s 3D NAND solid-state drives to store the data from this network (up to 1 terabyte is generated each day) and Intel Xeon chips to process it. Rolls-Royce’s Intelligent Awareness system coordinates data from multiple systems to tell crew about nearby vessels and obstacles. The Intelligent Awareness system can automatically classify nearby ships, whether they’re pleasure craft, cruise ships, tankers, or tugs. It enables better visibility in poor weather conditions by combining and centralizing data from multiple sources, and it’s particularly useful when ships are navigating in close quarters, like docking at berths. web of cameras and sensors one step toward that. Before ships can steer themselves, they need to reliably recognize their surroundings. Daffey says one of the biggest challenges now is creating an international legal system to govern the deployment of autonomous ships. “Within the next 18 months to two years, we will see the first commercially operated remote-control vessels,” says Daffey. “But they’ll be in coastal waters so that individual countries can set the legislative environment.” Ocean-going autonomy will have to wait until countries can agree on common codes, and it’s unlikely that ships carrying volatile substances (like oil and gas) will ever go fully crew less. 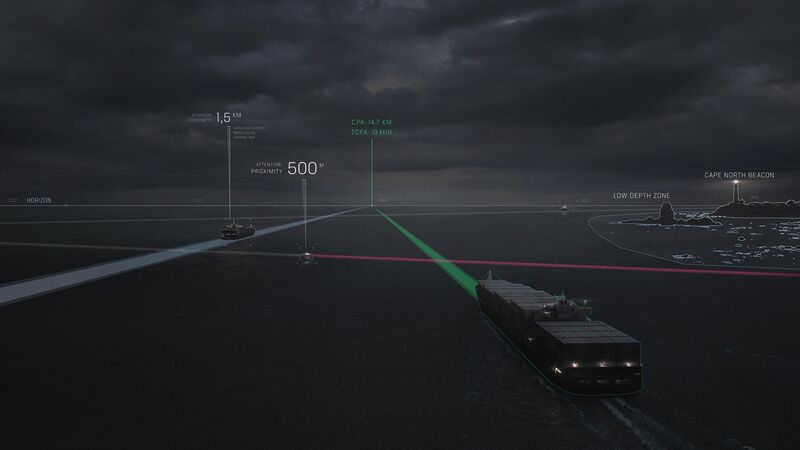 For Rolls-Royce, though, this partnership with Intel gives it the hardware it needs to power its Intelligent Awareness systems and ultimately start fielding fully autonomous vessels. “This is the first step along that journey,” says Daffey.